Co-sponsored by UIC Gender and Sexuality Center. Me&MyBois is a collective of masculine of centered people creating media outlets for LGBTQ people of color. 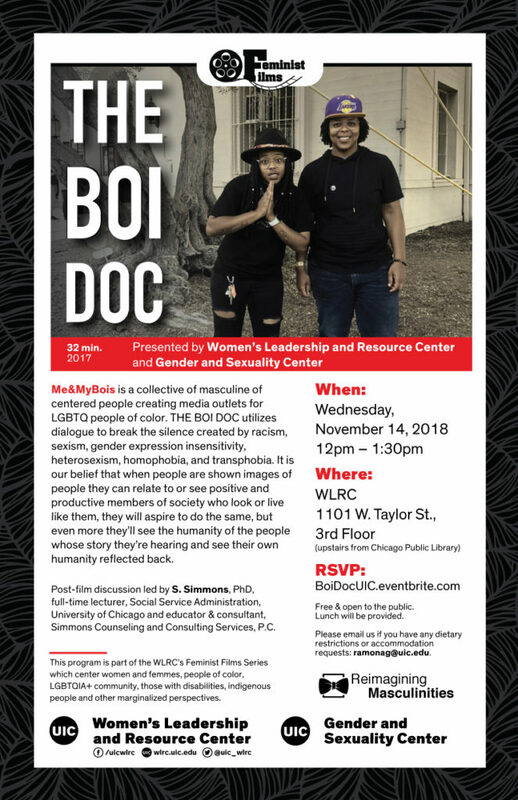 THE BOI DOC utilizes dialogue to break the silence created by racism, sexism, gender expression insensitivity, heterosexism, homophobia, and transphobia. It is our belief that when people are shown images of people they can relate to or see positive and productive members of society who look or live like them, they will aspire to do the same, but even more they’ll see the humanity of the people whose story they’re hearing and see their own humanity reflected back. Post-film discussion led by S. Simmons, PhD, full-time lecturer, Social Service Administration, University of Chicago and educator & consultant, Simmons Counseling and Consulting Services, P.C. Free & open to the public. Lunch will be provided. Please email us if you have any dietary restrictions or accommodation requests: ramonag@uic.edu.